Boasting an impressive blend of refinement, dynamics and design, all enhanced with the latest technologies that keep you connected and entertained, the 2017 Jaguar XF in Bexar County TX is ready for any of your automotive adventures. If you desire a midsize luxury sport sedan that offers high-level driving excitement, impeccable styling, world-class comfort and technological sophistication, then were confident you'll love the new XF. 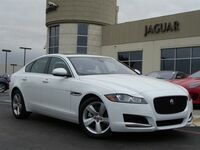 Get behind the wheel of the 2017 Jaguar XF at Barrett Jaguar! Are ready for pure driving bliss? With its superior ride comfort and outstanding sports handling, the 2017 XF delivers a breadth of exhilarating driving experiences. The foundation of the new XF is the advanced aluminum intensive architecture developed by Jaguar Cars that provides an impeccable ride, handling and dynamics. This new architecture facilitates a near perfect balance, supporting an agile and precise drive. Also, whether you’re accelerating on the highway, cornering on country roads or navigating uneven surfaces around town, the available Adaptive Dynamics is designed to instinctively modify the vehicle’s response to conditions and your driving style. The 2017 XF is well-equipped with state-of-the-art technology. 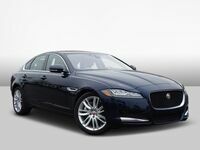 This includes the Meridian Sound System (Standard 380 W; Available 825 W), Jaguar InControl infotainment suite and available Head-Up Display System and driver assistance features. XF customers have a choice of three engines: the 180-hp 2.0 L 4-cylinder turbocharged diesel, 340-hp 3.0 L supercharged V6 and 380-hp 3.0 L supercharged V6. Performance is further aided by the XF's lightweight aluminum architecture, electric power assisted steering and available Instinctive All-Wheel-Drive with Intelligent Driveline Dynamics. The new XF really draws you in with its taut and athletic exterior. Notable design features include an upright front grille, signature J-Blade LED daytime running lights and advanced aerodynamics. Inside the cabin, you'll have a choice of luxurious carbon fiber or wood finishes. Wherever your journeys take you in South Central Texas, you can enjoy a well-connected and entertaining ride in the 2017 XF. Experience the latest in-car infotainment and stay connected to your XF and the world with the Jaguar InControl suite of advanced technologies. These intelligent solutions integrate seamlessly with your personal devices, data and media — helping to improve and enrich your ownership and driving experience. Focus on the road with an advanced Head-Up Display system using laser technology. This optional state-of-the art system projects a range of important information onto the windshield, where its crisp, bright image can display vehicle speed, navigation, cruise control notifications and Traffic Sign Recognition data, remaining clear even in direct sunlight. With its taut and athletic exterior design, you'll surely be turning heads as you pass on by in the 2017 XF. The confident, upright grille and deep power bulge on the hood reinforce its intent. The vehicle has a perfectly proportioned profile highlighted by a single, elegant arc which runs the length of the body, culminating at distinctive, wraparound LED taillights, with F-TYPE-inspired double roundel. Inside the XF, a range of contemporary materials are exquisitely crafted to offer exceptional comfort and a sense of well-being. The centerpiece of the interior is the unique wood insert that the XF shares with the other cars in the Jaguar range. It sweeps from over the instrument panel across the top of the fascia and along driver and passenger doors. Feel free to contact us at Barrett Jaguar to take the luxurious and high-performance 2017 XF for a test drive!